From the train/bus station please go straight ahead into Krupówki Street (upon leaving the station go straight ahead for about 1 kilometer). At the intersecion of Krupówki and Kościuszki Street turn left (into Krupówki Street). 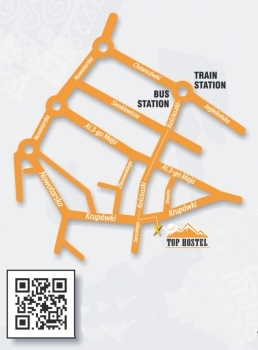 Top Hostel is on the right side, approximately 20 meters away from the intersection, next to MacDonald’s.